If you’ve read about our previous experience at KODE, you’ll be aware that we are already fans of this wonderful restaurant. Recently, we stopped by to try their newly introduced Sunday Brunches. With a specially curated menu and as well as a buffet spread, the Sunday Brunch at KODE is priced at Rs.1750 + taxes. 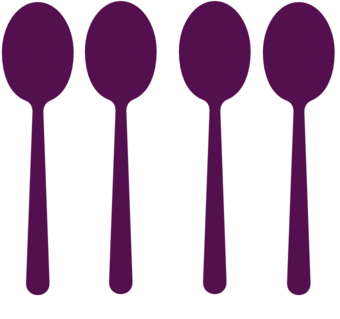 The buffet spread included a range of cold cuts, cheese, sushi, salads, mezze and soups. We started off with the salads, and mezze moving on to the sushi and soup. There was a menu that had hot food coming to our table straight from the kitchen. From the menu we ordered for the Turkish Flatbread with Meatballs – quite an interesting twist to the regular flatbread, came in the shape of a boat. The Shrimp Crostini, Shrimp tossed in a mustard sauce served on toasted bread, Potato Bravas – this was more like baby potatoes tossed in a tomato based sauce. The Buffalo Wings with a Blue Cheese Dip and the Herb Roast Chicken with Rosemary Potatoes and Jus, both were impressive. Well cooked and flavourful, a delight for non vegetarians. The star dish of the afternoon was the Lamb Shank with Red Wine Au Jus – melted in our mouths and was extremely succulent, a must try. For drinks, we ordered theForgotten petal sour – Campari soap, with champagne foam, rose petals dipped in nitrogen, drink garnished with beetroot powder – absolutely loved the presentation. The Bird Eye, a vodka based drink, was served in a fish bowl and placed on a bird’s nest also looked spectacular. The drama that accompanied the drinks made it all worth it! The dessert spread included Cheesecake, Creme Brule, Tiramisu, Chocolate Mud Pie, Chocolate Eclair, Blue Berry Yogurt and Caramel Ice Cream. While desserts are always great, are favourites were the Tiramisu and the Mud pie with Caramel Ice Cream. 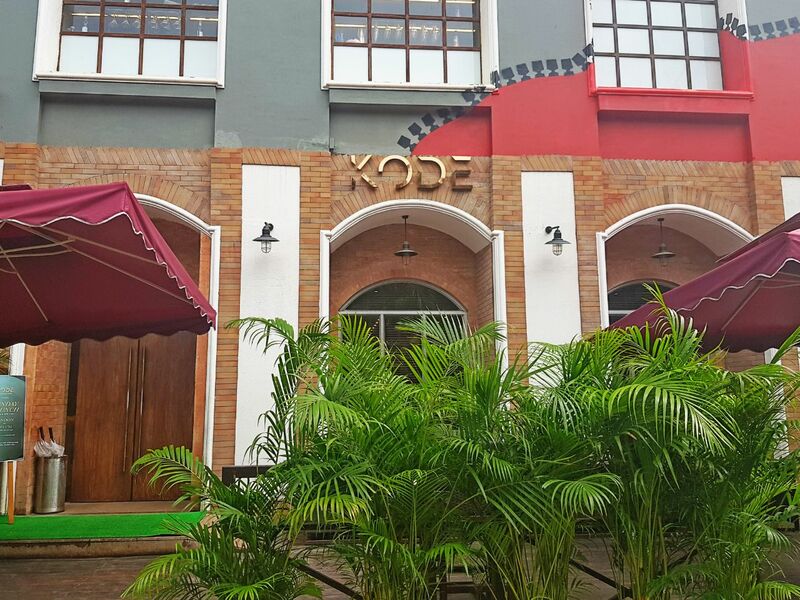 Overall, if you’re planning to spend the weekend indulging in some good food, KODE should definitely be your pick! Landmark: Near Smaaash, Kamala Mills, Lower Parel. 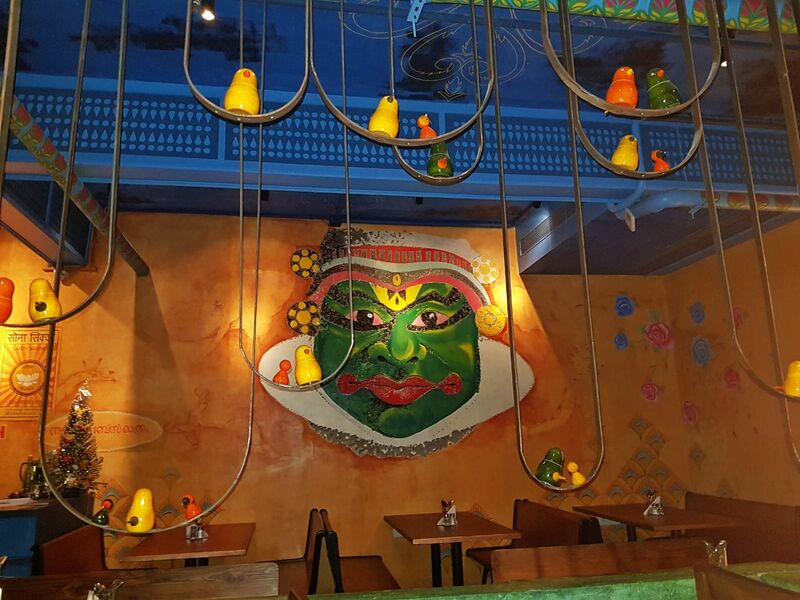 Gastro Darshini by day Café Bar by night, that’s how they describe this newest South Indian themed bar and kitchen that has opened doors in Kamala Mills. We spotted this new entrant on our recent visit to Kamala Mills and it immediately caught our attention. 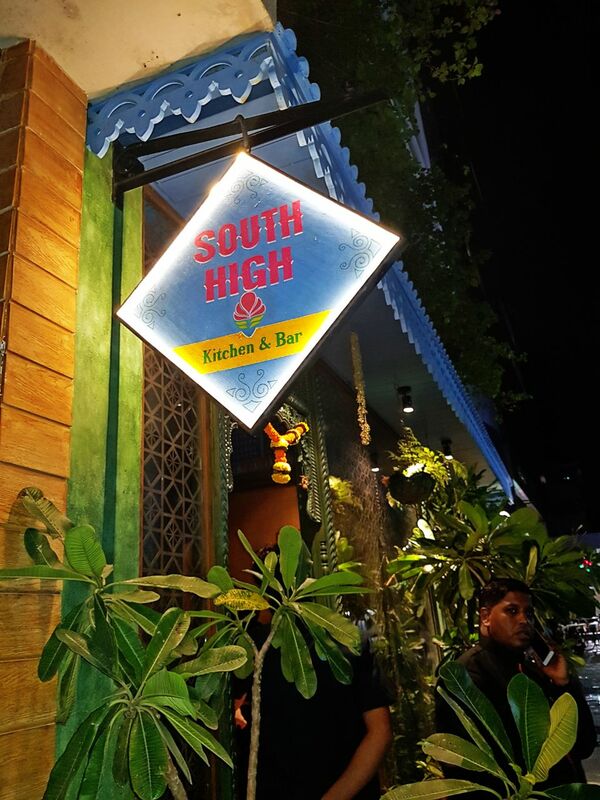 Got to know that it is run by the guys behind Mahesh Lunch Home and that being one of our favourites, our decision to dine was quite easy to make. The interiors of South High Kitchen & Bar are contemporary with some traditional elements. Our favourite corner was the one with the patcha face graffiti. Coming to the food, we absolutely loved the Koli 65 Pakoda – Deep fried marinated chicken and onion which came with a chutney, the Dosa Tacos were also interesting, looked like a Taco, tasted like a dosa. In the mains, the Chicken Ghee Roast and Chicken Gassi are a must try. I also tried their Signature Cocktail, the South High Whiskey Sour, which was your regular Whiskey Sour with a punch of Kokum. If you like your whiskey sour the classic way, then don’t try this one. Although, we quite enjoyed the South Indian version. Overall, South High is a great place for a delicious South Indian meal. It’s got a great vibe and some delicious options on the menu. Service can be a bit slow, but we can pass that off as a teething issue.